The Champions List....Who will Be Next ??? A few years ago I compiled this list of all the Champions going back to our first State Meet in 1938. It was an incredible project, and hopefully this brings back some memories for some coaches and athletes. If any mistakes were made please forward them along, we are also missing some assorted results here and there, mostly prior to 1970. Please help Milesplitmass fill in the remainder of the missing data. 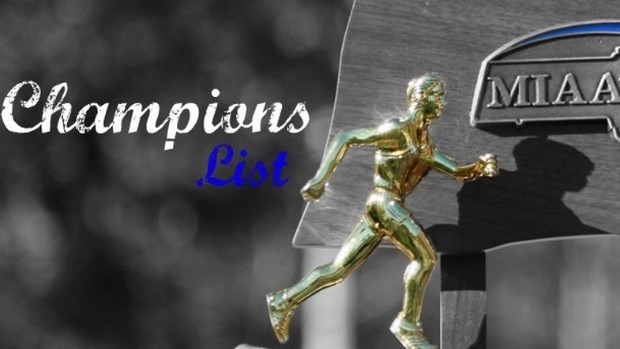 The MIAA will crown new Champions this weekend, and we are looking forward to adding them to our "List of Champions" ! G-D1 Claudia Graham Melrose ? Falmouth ? B-D1 Don Luisi Rockland 12:24 English ? B-D2 Frank Burns Beverly 12:53 Watertown ? B-D3 Alan Osbourne Winchester 12:47 Winchester ? B-D4 Bill Jones Everett Vocational 12:47 Scituate ? B-D2 Bob Cheves Boston Commerce ? Watertown ? B-D4 Louis Farrel Winchester ? Rockland ? B-D1 Tom Tomassian Boston Trade 13:26 Melrose ? B-D2 Al Porter New Bedford Voke ? New Bedford Voke ? B-D3 Dave Dahl Hyde Park 13:18 Wakefield ? B-D4 Neil Wallace Milton 13:03 Winchester ? B-D1 Bill King English ? English ? B-D2 Warren Harding Braintree ? Rockland ? B-D2 Kenneth Parke Worcester- North 13:16 Beverly ? B-D1 John Bennett Fitchburg 12:55 Watertown ? B-D1 ? ? ? ? ?